Learn all you need to know to make an informed choice when specifying the best pool lift for your swimming pool, hydrotherapy pool or hot tub. To choose the best pool lift for your pool you need to think about who will be using the lift. Do you need to be able to hoist people using a sling or will you or your clients be able to sit in a chair? Portable pool hoists require no fixing to the deck and transport the swimmer from poolside into the water by means of a fixed seat. If the person using the lift needs to use a sling then a deck mounted pool lift will be required. Most portable pool lifts need the swimmer to be sat on the lift whilst its transported to the poolside, however there are some which have a chair that can rotate. It is important that the poolside is relatively level and doesn't have a slope of more than a couple of degrees because the transportable pool lifts are all reasonably heavy. Fixed pool lifts need a hole to be diamond drilled into the pool deck so that an anchor or socket can be sunk into place or surface mounted. Deck mounted pool lifts may have a seat or a spreader bar and sling and some models can be adapted to work with a chair and a sling. Generally speaking you will need a fair amount of concrete in order to fit the socket, although sometimes it may be feasible to weld the anchor to a steel framed pool. There are various options available for pools with only a small amount of concrete at poolside and it is very unusual for us to not be able to find a solution. 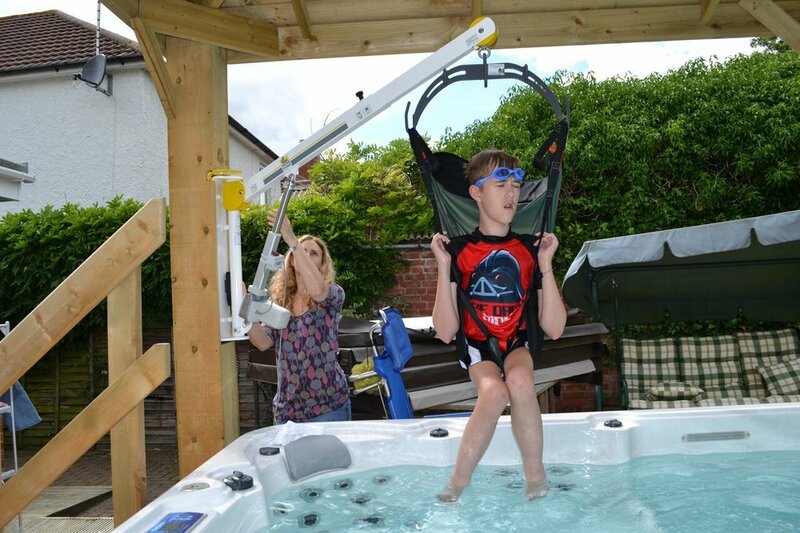 Over the years we have used several lifting devices to help people access their hot tub, jacuzzi or swim spa. Each site presents a different set of challenges so we have compiled a range of lifts that meet every need. We have options for wall mounted, deck mounted or portable hot tub lifts and our specialist advisers will work with you to specify the most suitable product. Occasionally it may be more suitable for a ceiling hoist to be used if there is a very narrow deck around the pool or if it isn't possible or desirable to use a conventional pool lift. One benefit is the potential to hoist somebody from the changing room area all the way into the pool. It is important to make sure the ceiling hoist can stand up to the harsh environment that is usually encountered when there is atmospheric moisture. To guard against corrosion the hoist should have extra membrane panels in addition to having the internal pcb's treated for use with pools. Independent suppliers of stairlifts, hoists, step lifts, pool hoists and home lifts. Sign up for special offers and updates.